The Finnish phonemaker adds up another phone to the budget phones lineup. It is named as the NOKIA 114. But, surprisingly, this time there has been no proper introduction or so, and the phone has very quietly appeared up on the Nokia India's Website. The Nokia 114 is a dual-SIM phone based on Series 40. The phone weighs 80gm and sports a 4.57cm QVGA colour screen LCD display. The device has a alphanumeric keypad and lookswise, it looks like Nokia 109's twin. The device has 64MB RAM and 16MB internal memory which is expandable upto 32GB via microSD card. The device also comes equipped with a 1,020mAh removable battery and the company claims a 2G talktime of 10.5 hours and standby time of 367 hours. It has a 0.3 MP VGA camera with 4X zoom. The phone also contains the Nokia Stereo Headset WH-102. The Nokia 114 is based on Nokia’s Series 40 platform. Being an Internet-focused handset, Nokia 114 comes packed with connectivity features including Bluetooth 2.1, GPRS and EDGE. 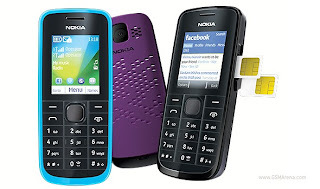 As Nokia 114 is specially designed to let consumers to access the web easily to stay connected and hence, it is loaded with instant messaging services including Twitter, Facebook chat, Windows Live Messenger and Nokia Chat. Moreover, it comes with Easy Swap feature, which lets consumers to switch between the SIM cards without much difficulty. Further, the handset is preloaded with Nokia Xpress Browser that enables for 90% faster browsing experience. The Nokia 114 is currently listed as “COMING SOON” on the Nokia India's Website. So, we dont have any info regarding the availability and the release of the device. But, yes it should be priced at around Rs. 2,400. 0 Respones to "SILENT LAUNCH OF THE NOKIA 114"